Office Space - Illingworth, West Yorkshire. Contemporary office space within a converted Victorian spinning mill. 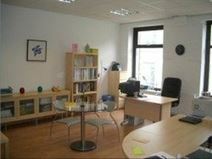 Recently renovated and equipped to a high standard, complete with on-site parking, CCTV and live-in security. Close to Halifax town centre, with a range of excellent amenities, including cafés and supermarkets, close at hand. Good public transport connections to Bradford, Keighley and Halifax.